Curved End; 20 mm at the lugs by 18 mm at the buckle end. Pink 18 mm Alli-Grain Stitched; 18 mm at the lugs by 16 mm at the buckle end. Curved End; 20 mm at the lugs end by 18 mm at the buckle end. 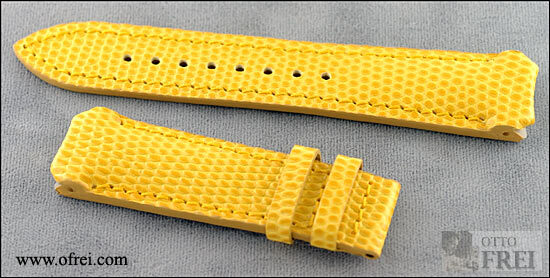 Yellow lizard grain, non-padded/stitched. No buckle. Buckle end measures 2 1/2 inches; hole end measures 4 1/4 inches. Light Sea Green 18 mm Alli-Grain Stitched; 18 mm at the lugs by 16 mm at the buckle end. Buckle End measures 3 3/8 inches; Hole End measures 4 1/2 inches. Red 21 mm leather strap with white center stripe; 21 mm at the lugs by 20 mm at the buckle end. No buckle. White 20 mm Alli-Grain Stitched; 20 mm at the lugs by 18 mm at the buckle end. Hole End measures 4 inches; Buckle End measures 2 1/2 inches. No buckle. 18 mm at the lugs by 16 mm at the buckle end. 18 mm at the lugs by 16 mm at the buckle end. Black smooth calf flat with gray stitching. Hole end measures 4 1/2 inches; buckle end measures 2 7/8 inches. No buckle. 21 mm leather deployment strap. Flat/Non-stitched. Hole end measures 4 5/8 inches; buckle end measures 3 inches. No buckle. 18 mm at the lugs by 16 mm at the buckle end. Honey croco-grain, flat/stitched, no buckle. Hole end measures 4 inches; buckle end measures 3 inches. 20 mm lug width by 18 mm buckle size. Flat/Stitched. Hole end measures 4 1/4 inches; buckle end measures 2 1/2 inches. No buckle. 20 mm at the lugs by 18 mm at the buckle end. Black padded leather with beige stitching. Hole end measures 4 7/8 inches; buckle end measures 2 7/8 inches. No buckle. White 17 mm Alli-Grain Stitched; 17 mm at the lugs by 14 mm at the buckle end. Buckle End measures 2 inches; Hole End measures 4 1/4 inches. No buckle. 14 mm at the lugs by 13 mm at the buckle end. 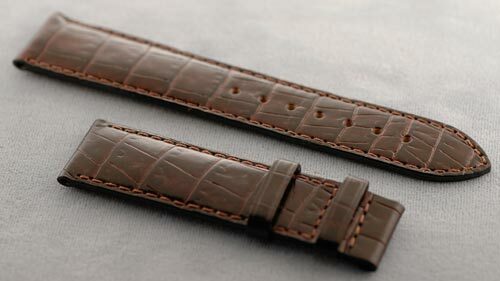 Brown croco-grain, flat/stitched, no buckle. Hole end measures 4 1/4 inches; buckle end measures 2 3/4 inches. Blue 12 mm Satin leather strap; 12 mm at the lugs by 12 mm at the buckle end. Hole End measures 4 inches; Buckle End measures 3 inches. No buckle. Red 12 mm Satin leather strap; 12 mm at the lugs by 12 mm at the buckle end. Hole End measures 4 inches; Buckle End measures 3 inches. No buckle. 14 mm lug width by 12 mm buckle size. 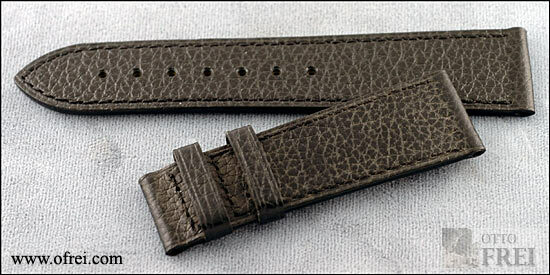 Black croco-grain flat/stitched leather band. Hole end measures 4 inches; buckle end measures 2 3/4 inches. No buckle. 14 mm lug width by 14 mm buckle size. Black alli-grain flat/stitched leather band. Hole end measures 4 3/8 inches; buckle end measures 2 3/4 inches. No buckle. Black Smooth Calf; 19 mm at the lugs by 18 mm at the buckle end. gray Stitch Padded. Buckle End measures 3 inches and the Hole End measures 4 5/8 inches. Deployment/Buckle NOT included. Black Smooth Calf; 20 mm at the lugs by 18 mm at the buckle end. gray Stitch Padded. Buckle End measures 3 inches and the Hole End measures 4 5/8 inches. Deployment/Buckle NOT included. Black Smooth Calf; 22 mm at the lugs by 18 mm at the buckle end. gray Stitch Padded. Buckle End measures 3 inches and the Hole End measures 4 5/8 inches. Deployment/Buckle NOT included. MATTE BLACK ALLI-GRAIN; 22 mm at the lugs by 20 mm at the buckle end. Buckle End measures 3 inches and the Hole End measures 4 3/4 inches. Deployment/Buckle NOT included. MATTE BLACK ALLI-GRAIN; 23 mm at the lugs by 20 mm at the buckle end. Buckle End measures 3 inches and the Hole End measures 4 3/4 inches. Deployment/Buckle NOT included. Dark Brown Matte Finish Alli-Grain Leather; 22 mm at the lugs by 20 mm at the buckle end. Stitch Padded, Curved Ends. Buckle End measures 3 inches and the Hole End measures 4 5/8 inches. Deployment/Buckle NOT included. Brown Alli-Grain Leather; 23 mm at the lugs by 20 mm at the buckle end. Stitch Padded, Curved Ends. Buckle End measures 3 inches and the Hole End measures 4 5/8 inches. Deployment/Buckle NOT included. Brown Padded Stitched Alli-Grain Leather; 22 mm at the lugs by 20 mm at the buckle end. Sold Strap only without buckle. Buckle End measures 2 7/8 inches and Hole End measures 4 1/2 inches. 20 mm at the lugs by 18 mm at the buckle end. Hole end measures 4 1/2 inches; buckle end measures 3 inches. No buckle. Reddish Brown Padded Stitched Alli-Grain Leather; 19 mm at the lugs by 18 mm at the buckle end. Sold Strap only without clasp. Sold Strap only without clasp. Brown Alli-Grain Leather; 22 mm at the lugs by 20 mm at the buckle end. Sold Strap only without clasp. 20 mm lug width by 18 mm buckle size. 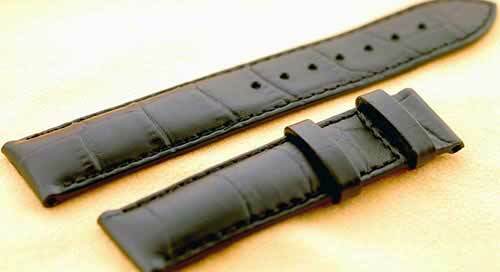 Black alli-grain flat/non-stitched leather band. Hole end measures 4 1/2 inches; buckle end measures 3 inches. Does not come with yellow Tissot buckle. Black Alli-Grain Leather; 23 mm at the lugs by 20 mm at the buckle end. Stitch Padded, Curved Ends. Buckle End measures 3 inches and the Hole End measures 4 5/8 inches. Deployment/Buckle NOT included. 19 mm at the lugs by 18 mm at the buckle end. Medium Brown Calf Leather with Beige Stitching; 20 mm at the lugs by 18 mm at the buckle end. 20 mm at the lugs by 18 mm at the buckle end. 21 mm at the lugs by 18 mm at the buckle end. Black Calf Leather with Yellow Stitching; 20 mm at the lugs by 18 mm at the buckle end.